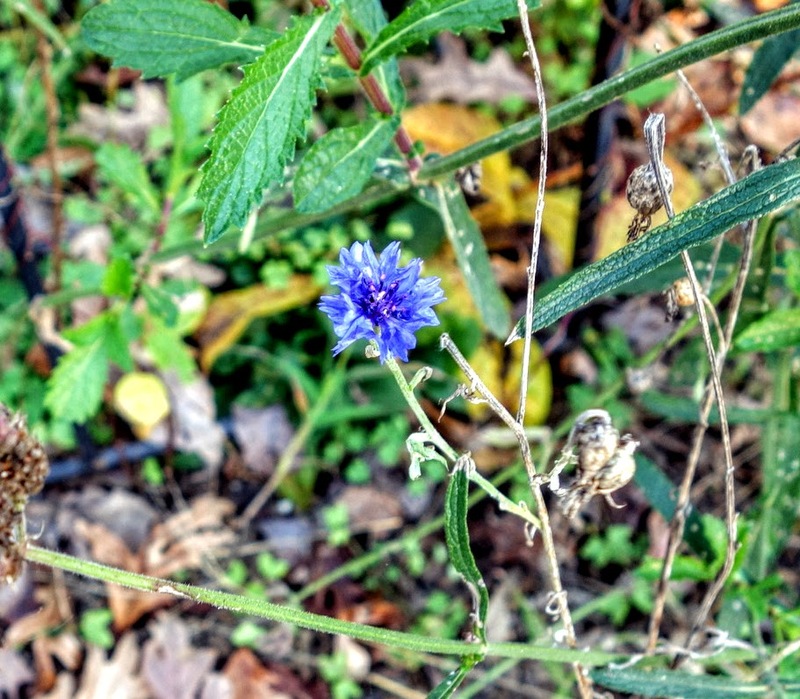 As summer comes to a close – complete with drenching rains, high humidity, more rain, and none of the September weather we loved in the olden days – here are a few lessons learned in the garden. Don’t use angel wing begonias in the window box on the railing, they are totally out of proportion there and far too upright despite the way the flowers droop. 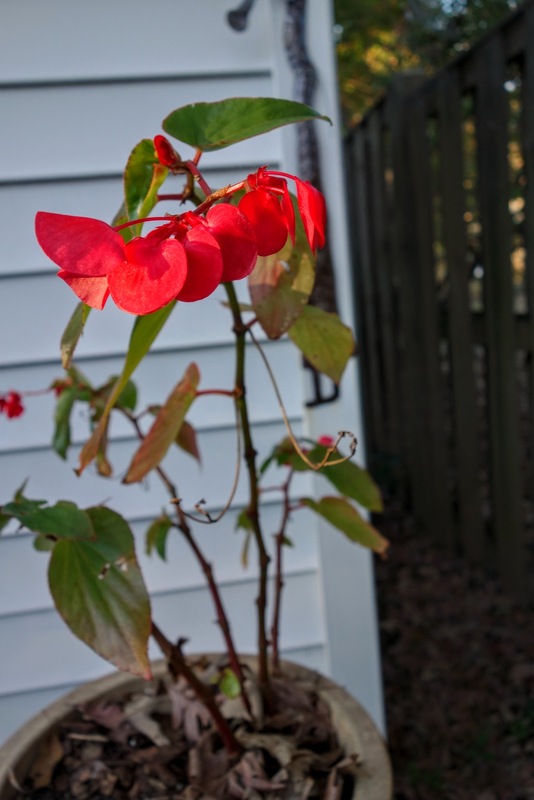 Choose a constant bloomer for the hanging basket by the bird feeder, maybe the dull but reliable impatiens. This year’s begonia was glorious for a few weeks, then stopped blooming entirely. Give the milkweed LOTS of room to spread out, and be prepared for the aphids to cover it and the caterpillars to decimate it. Plus: you might see Monarchs eventually! Plant the Shirley poppies in late winter and choose colors carefully. They will bloom for months and months, so be sure their color blends with other bloomers (pinky white viburnum, various dahlias and zinnias). Here’s the pale yellow in August, still in bloom. No more tomatoes unless they are cherries. The patio tomato sulked, produced half a dozen tomatoes, and proceeded to rot. 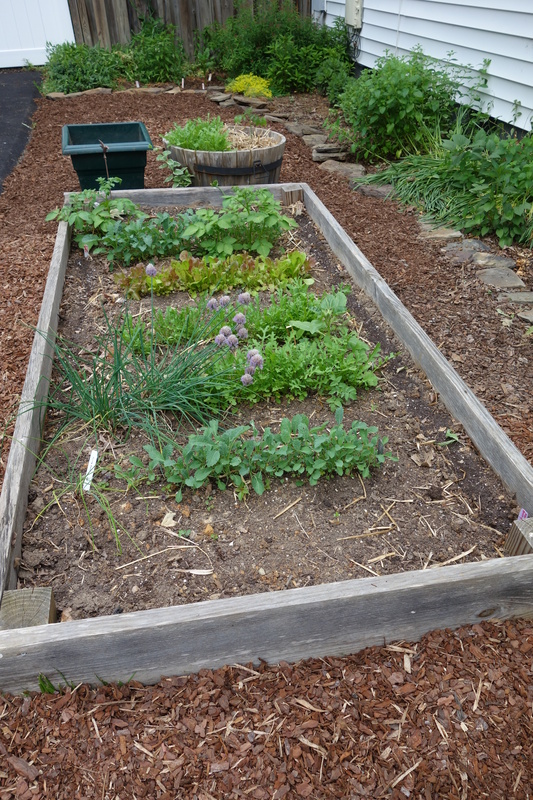 Plant the tomato in the raised bed and stand back! 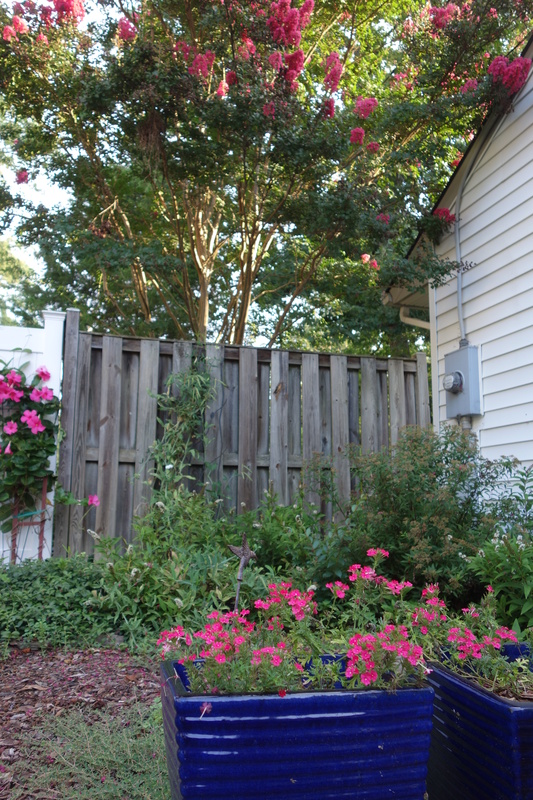 Hanging plant in front – never again a geranium, it dries out too quickly and fades away. Calibrachoa or another reliable bloomer instead. 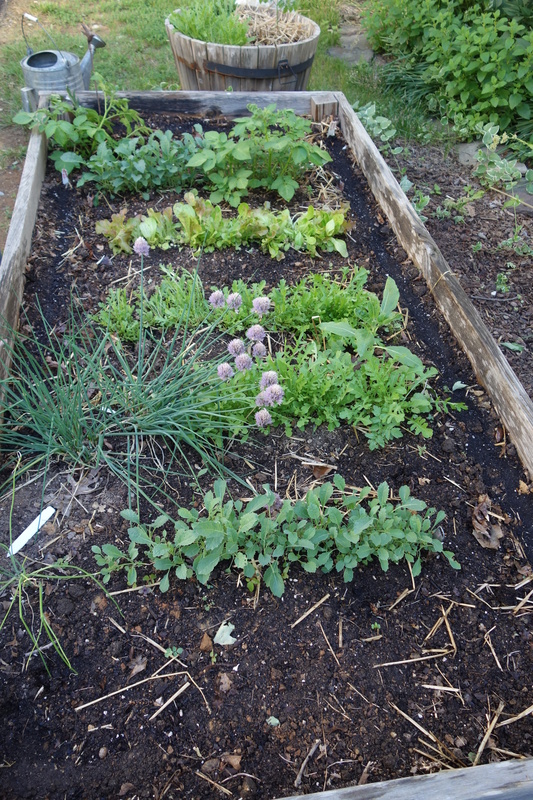 Feed the hungry: get a weekly fertilizer plan and do it. Ditto the twice-monthly fish emulsion for the roses. 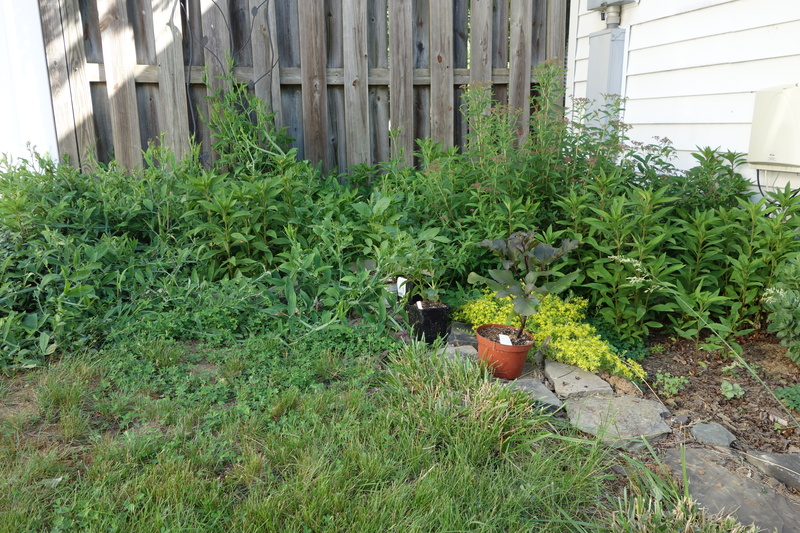 The Joe Pye weed was magnificent this year, I only hope it doesn’t get much bigger. The Souvenir de Ste. Anne rose twirled around it, as did the white cosmos, in a very delightful way. Speaking of roses, both the Zepherine Drouhin and the other re-bloomed a couple times over the summer, well worth having them around, even though the St. Anne got Japanese beetles and the Zeph lost leaves and got leggy. Next year will be even better!!! I’ve been wary about growing roses. Their reputation is for finickiness and the prevalence of diseases that call for chemical sprays. The plant itself is not lovely, at least not usually. 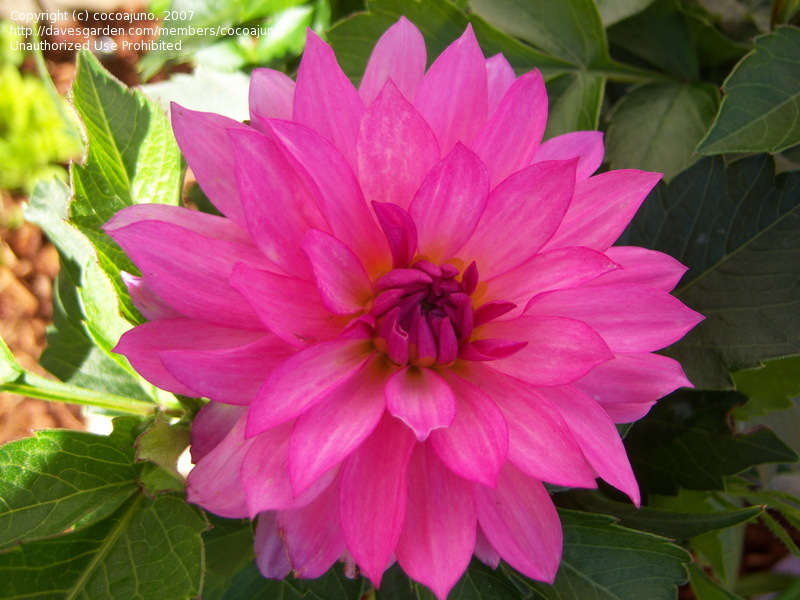 But when a friend brought me a blossom of “Zephirine Drouhin,” I fell head over heels in love. That color! That scent! 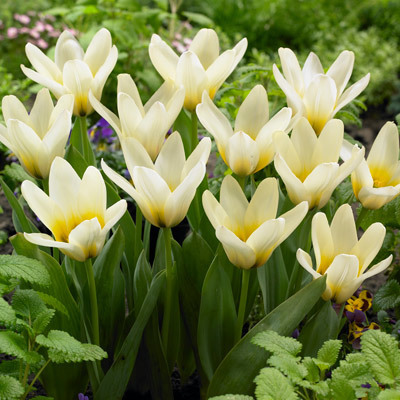 Plus, it is almost thornless and can tolerate shade. I must have one. But the first one died. And the second one, found at Roxbury Mills and planted in 2009, did well for a while. Though I only got a few blossoms, I was in love. But sadly, I had an infestation of voles (I’ve since learned that the vole population waxes and wanes. It’s on the wane now, for which I’m grateful.) The voles ate the roots and it was adieu to Zepherine. Undaunted, I bought it again from White Flower Farm in the spring of 2015, and this year it just went to town. Here is the current, third attempt. As you can see, the plant itself is not handsome, but those blossoms! You should have smell-a-vision to get the full glory. Aphids, leafhoppers, spider mites, scale, caterpillars, sawfly larvae, cane borers, Japanese beetles, rose stem girders, rose midges, rose slugs, rose chafers, leaf-cutting bees, black spot, rust, powdery mildew, crown gall, canker, dieback, downy mildew, viruses. You see why I was reluctant? I knew I wanted a rose with fragrance, not too big, either yellow or pink. The Earthkind site led me to a small shrub rose, Souvenir de Ste. Anne. Since I had not only culled the columbines but dug out the problematic Helianthus ‘Lemon Queen,’ I finally had some space for a plant that likes sun and good air circulation, so I placed my order with the Antique Rose Emporium. Well, after all that build-up, here’s what I got, but remember! This had been in the ground less than a month when it bloomed, so I give it props. (It would also help if I could figure out how to capture pale pinks, yellows and creams without washing out all the color.) I’m feeling quite hopeful. 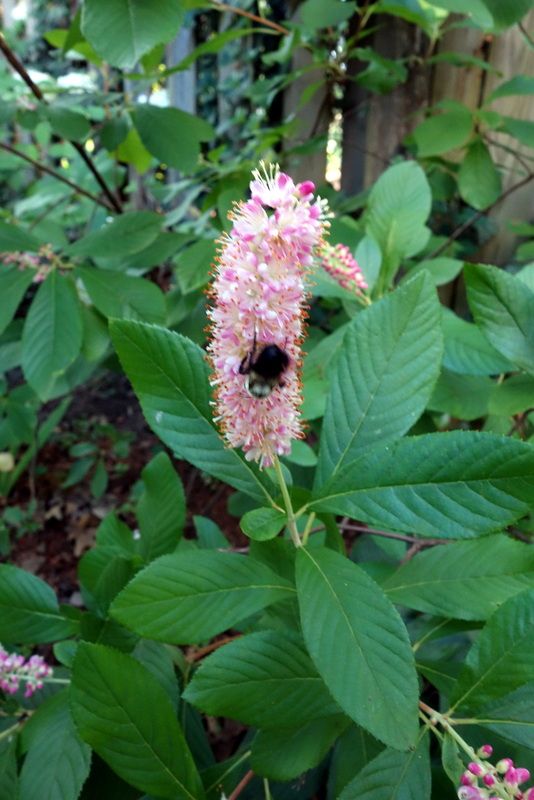 The clethra has finally bloomed abundantly and is just as fragrant as I’ve been told. The bees love it, too. This is ‘Ruby Spice.” I saw a clethra somewhere recently that was as big as a small tree, so I’ll have to keep an eye on this. At least it is finally in a site where it can thrive. The pink garden is coming right along, helped by the bright pink verbena I bought on a whim, and the pink Mandevilla vine that my neighbors planted. 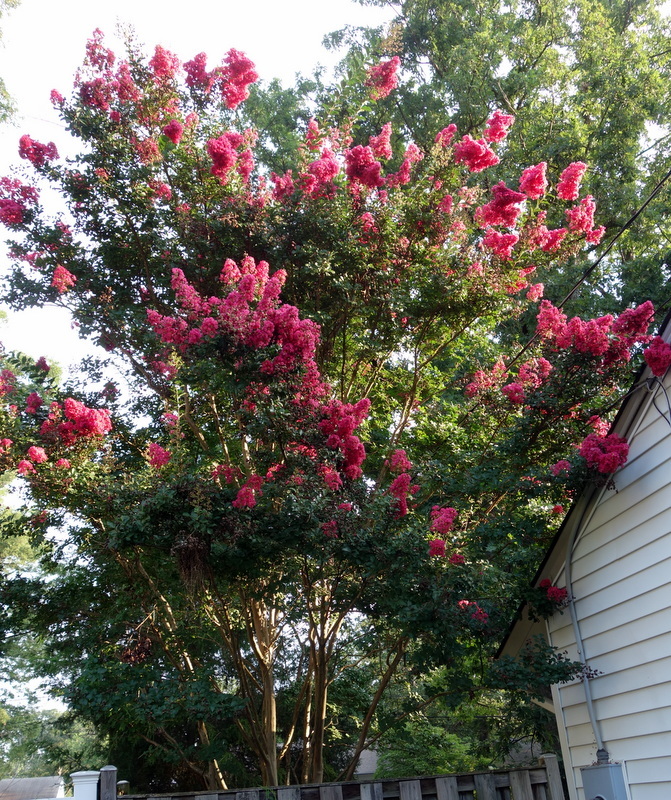 Here you see the crepe myrtle (is it Cherokee?) looming over the fence. It rains down tiny pink blossoms that fall onto the greenery below. 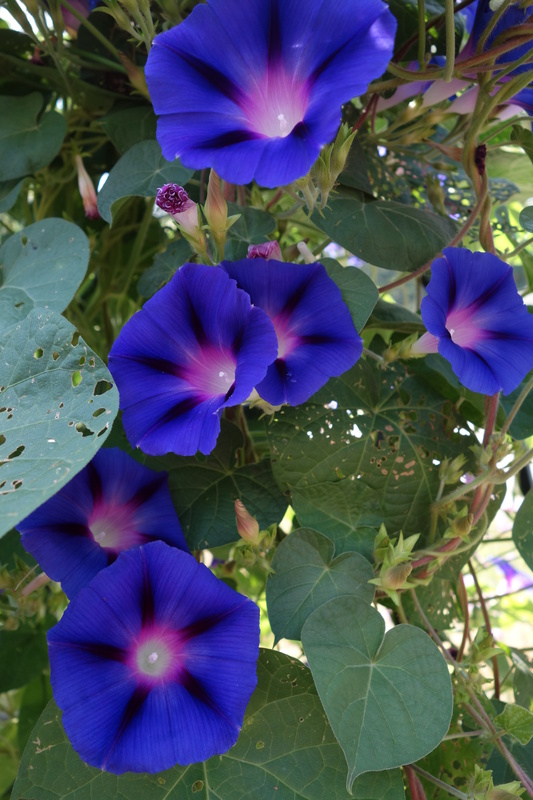 I finally tore down the thuggish morning glory that is self-sowing EVERYWHERE and didn’t look so good, despite this picture of the blossoms at their best. But you can already see that the leaves are being eaten by something, and the whole thing was looking shabby. I’ve planted some beans in its place. 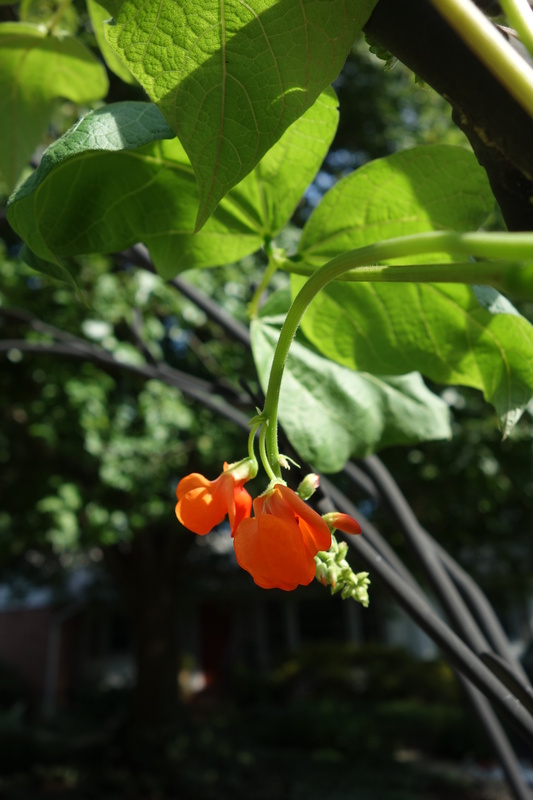 Finally, the scarlet runner bean, which actually has orange blooms, is doing well on one side of the trellis, while the elegant cardinal climber vine with its finely cut leaves and small, brilliant red flowers is carpeting the other side. They really don’t go together, and although the bean attracts myriad bees, you can probably tell which I prefer. 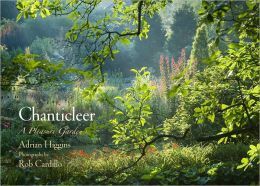 Not a single discouraging word is heard in this account of Chanticleer’s beauty, but judging by the spectacular photos by Rob Cardillo, the praise is justified. Though only twenty years old as a garden cultivated for public display, Chanticleer has great bones thanks to a 1930s stone house and mature trees, as well as a stream that runs through the site. Like me, the gardeners have made a woodland garden under a giant oak tree that used to sit in a sea of grass. Of course, they also have an Asian woods, an orchard, a pond garden, and so on. Clearly worth a visit! Adrian Higgins is one of my favorite garden writers. He clearly writes about Chanticleer with great knowledge and experience. Still, I couldn’t help feeling that this was written to order as a puff piece. (It’s copyrighted by Chanticleer rather than by Higgins.) Not quite a criticism, since I devoured every word, just an observation. *It turns out that an air spade costs almost $2000 and must be used mainly by professional landscapers and builders. So, never mind.